At the same time, one of my core world-building principles is that the nature of the world needs to suit to nature of the story. 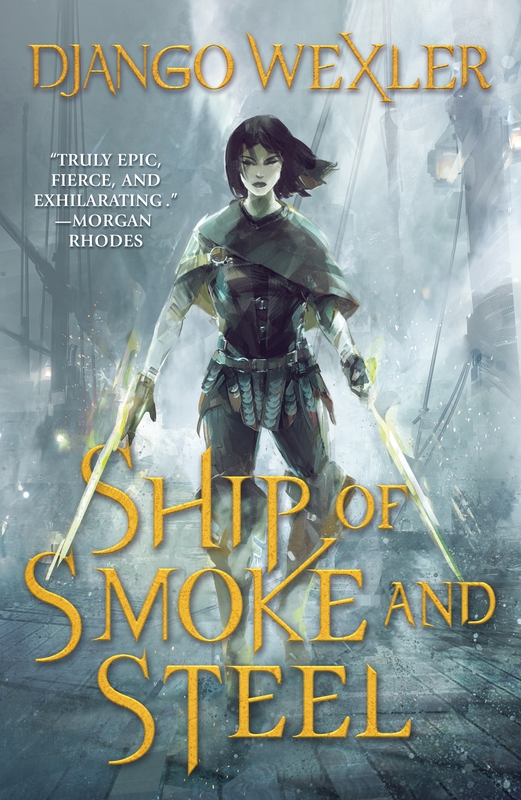 SSS is a YA adventure story, which imposed some rules on how magic could work in this world — it can’t be the sort of magic you have to spend fifty years practicing to get any good at, because I wanted to have teenagers running around using it to fight monsters. Isoka, the main character, is a rare magical adept born into the lower classes; ability to access the Wells is partly hereditary, and largely confined to the “mage-blood” nobility. The combination of these two elements makes the magic of SSS more like the mutant superpowers of the X-Men, say, then carefully-acquired spells of the D&D mage. That in turn has all kinds of interesting consequences for the social structure of the various societies in the world, since managing people with that kind of power isn’t easy. Isoka boards the ghost ship Soliton and meets others from all over the world, so I got to have great fun designing a wide range of societal adaptations to the way magic works. There are little asides in snippets of dialogue, some of which sadly had to get cut, that talk about the cultural differences — societies where mage-bloods rule, societies where they’re anathema, where they’re slaves, where they’re members of holy orders sworn to defend the throne, and so on. This is the kind of world-building I love, trying to imagine the consequences of some supernatural element in everyday life. Some specifics of the Wells also bear mentioning as among my favorites. There are more of them than I really need for the story, which gives the system a pleasantly baroque feel and provides some interesting material for future books. We don’t find out much about Xenos, or Kindre, or Sahzim. Having those seeds there, without always precisely knowing what they’ll be good for, is another fun piece that only occasionally gets me into serious trouble. 1) It looks cool. Especially since they got Richard Anderson, maybe my favorite cover artist, to do the cover! 2) Isoka’s armor in particular helps make for a very fast-paced plot. Getting hit doesn’t injure her, usually, but the energy it uses builds up as heat under her skin, which means that getting really badly beaten will burn her and eventually kill her. This means that when she fights somebody, there’s still a real threat (at least if the person has their own Wells, or is a giant crab) but she doesn’t take the kind of damage that a “realistic” fight would inflict, stabs and cuts and broken limbs and so on. That helps keep things moving, without long hospital stays between battles! Even with the best of intentions, Ghul can be dangerous. One attempt at healing gone wrong, for example, causes the intended recipient to rapidly bloat into a shifting, melting ball of flesh, screaming until they explode in a shower of gore. (Yes, it’s probably inspired by the movie you’re thinking of.) And that, obviously, is one of my favorite bits. You can find him online at www.djangowexler.com and on Twitter as @DjangoWexler.